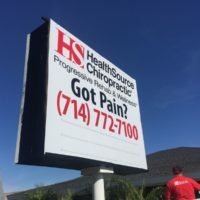 Custom signage can greatly increase your foot traffic, and out-front business signs in Orange County guarantees higher conversions from those passing by. 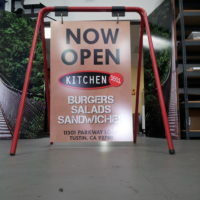 Even a strong online marketing presence can’t beat a high-impact custom sign in a local marketplace or even out front. The way you present your business physically is essential for building you brand, maintaining visibility, and connecting with your target audience. 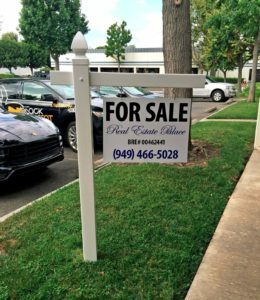 We want to share with you our best tips for external branding, including custom business signs in Orange County. 1. Monument Signs—a monument sign is the large sign out front of a business that tells customers exactly who you are. Benefits of monument signs include high-impact, eye-catching graphics and clear information. Many retail parks or business districts have strict dimension regulations, so be sure to design something within their specifications. Choose a durable material to ensure that your sign can withstand all types of weather. Monument signs should be easy to read and simple, but with enough information to let customers know they’re at the right place. 2. Window Displays—if your business has a lot of street-facing real estate, it makes sense to put it to use! Window decals and displays are easy to use, simple to apply, and budget-conscious, making them the best choice for seasonal changes or frequent updates like sales or specials. Department stores like Macy’s are known for their elaborate winter window displays, but don’t feel pressured to go all out—sometimes simple is the best route. 3. Floor Graphic—either on the side walk or covering your business floor, graphics on the ground level are easy to spot, eye-catching, and fun! Choose any sort of business logo or messaging and see how effective the “red carpet” treatment is! Guests and customers love this new twist on business signs in Orange County, and they’ll be more inclined to learn about your business. The floor houses a lot of prime real estate—why not put it to use!? 4. Portable Signage—get creative with a sandwich board, posters, or banners. These flexible and useful business signs allow you to keep things interesting and fresh with the ability to change out messaging frequently, promote one-time or special events, or point out new happenings quickly. Curb signs are a great way to showcase specials that change regularly, while floor stands point to sales areas, special events, or are simply eye-catching. If you’re ready to update your business’s signage, call us today at Black Parrot signs and see all the products we offer. Don’t be tied down with old-hat marketing—get innovative and fresh ideas for your business. Contact our knowledgeable sales team and discover what services or products we have that can elevate your business from ho-hum to sparkling. We have the signs and marketing expertise that you’ve been on the hunt for. Stand out from the crowd with Black Parrot signs and products. Call us today!